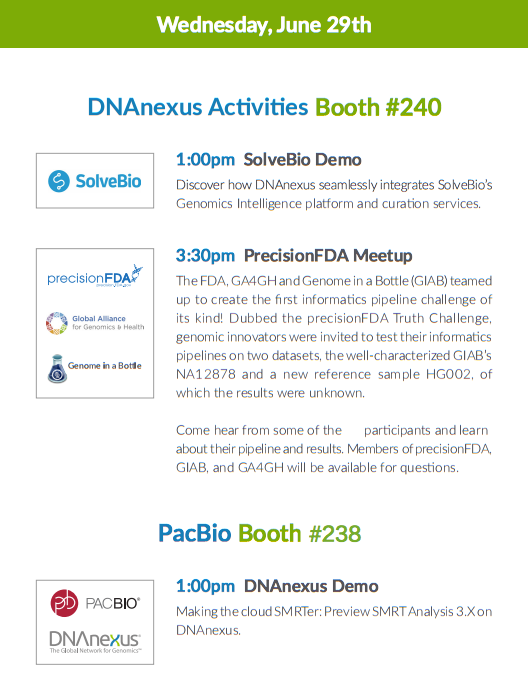 Next week we’ll be at Festival of Genomics in Boston, to join the three-day celebration of all things genomic! The Festival covers a broad range of topics; exploring new research, technology, and groundbreaking advancements in medicine. We’re excited to hear from the stellar lineup of speakers, such as renowned New York Times columnist, Carl Zimmer, providing journalistic perspective from the genome beat, and Diana Bianchi, from Tufts University School of Medicine, discussing prenatal testing in the genomics era. Like all good festivals, we mustn’t forget to take advantage of the full spectrum of attractions, including posters, workshops, exhibitors, technology forums, and more. 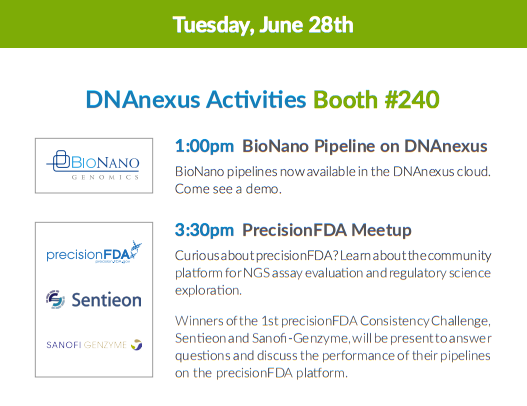 We’re particularly excited to showcase how the DNAnexus Platform has been powering precisionFDA. To date, more than 1,500 community members from 600 organizations are using the precisionFDA platform to help shape precision medicine. 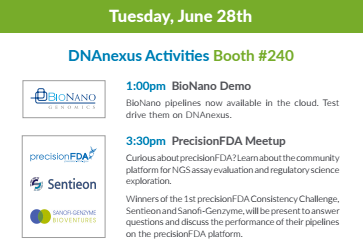 Members of the precisionFDA team will be at the DNAnexus booth to demo and answer questions about this community platform for NGS assay evaluation and regulatory science exploration. The announcement of the winners of precisionFDA’s second challenge, the Truth Challenge, will also be announced at the festival. Genomic innovators were invited to participate by testing their informatics pipelines on two datasets: the well-characterized Genome in a Bottle’s NA12878 and a new reference sample HG002, of which the results were unknown. Truly a once in a blue moon challenge, the competition was fierce as thirty-five participants from around the world submitted entries. Join us for the announcement and help us congratulate the winners! 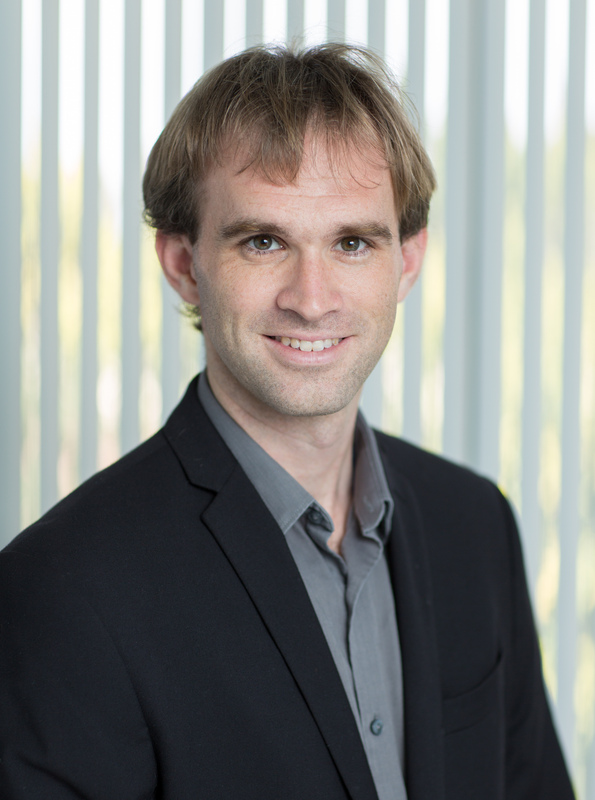 Additionally, during the Genomic Medicine track, our own Andrew Carroll will speak on the many factors involved when taking genomic data and medical applications global. 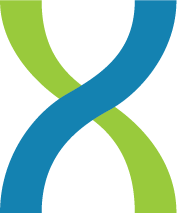 We hope you join in our excitement as we gear up for the ultimate genomic gathering! 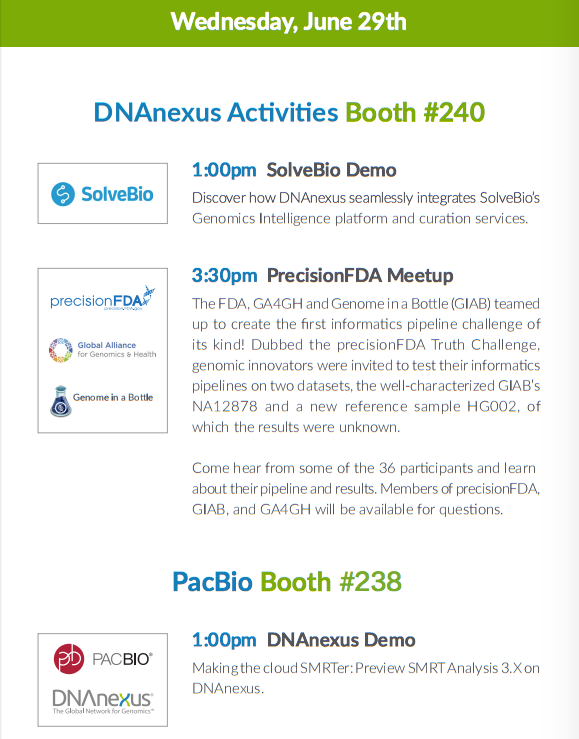 Don’t forget to come say hello to the DNAnexus team and receive a demo of the DNAnexus Platform at Booth #240.